I have been reading this forum many times but never posted. I am a homeowner who has read "The Lost of Steam Heating" and have always wondered about something peculiar in the basement. 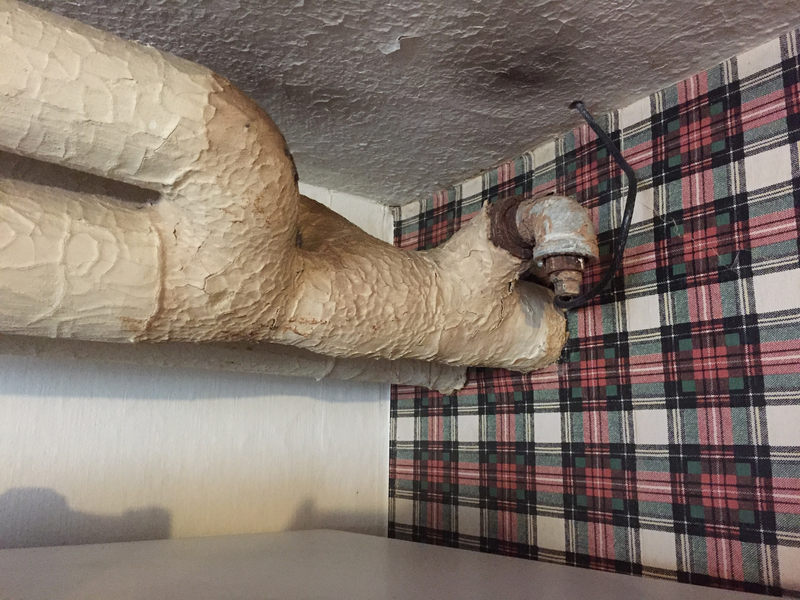 We live in a 1933 one-pipe steam house in metro Detroit. The basement steam main has a plugged connection that I always thought had been connected to a basement ceiling radiator but had never investigated. Yesterday, we took down part of the basement ceiling because it had been sagging for several years and wanted to repair it. 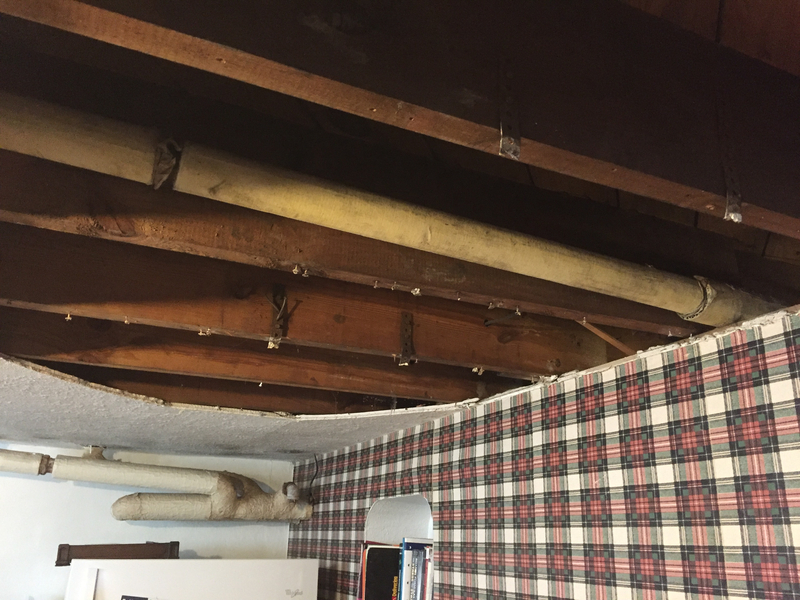 I noticed some old pipe hangers attached to the joists that had been cut some time before and seem to be in the perfect spot for where the ceiling radiator would have been (see attached photos). 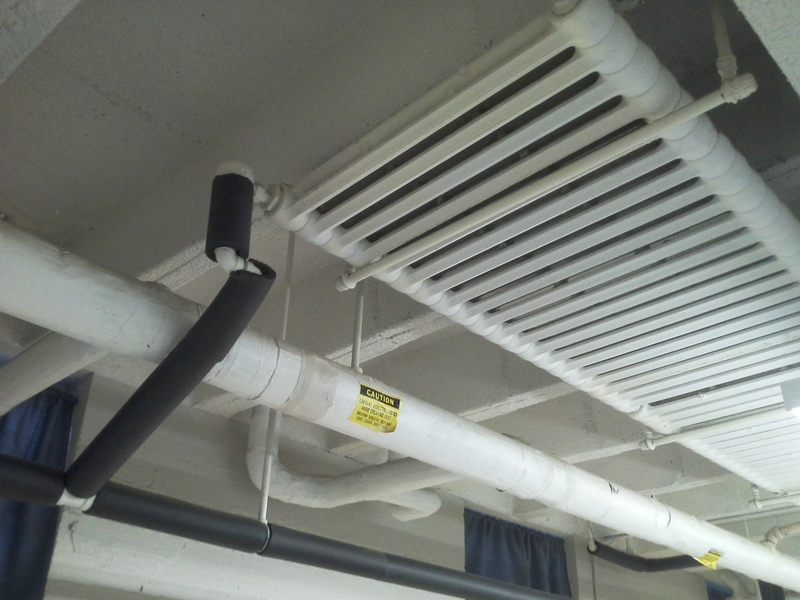 My question is: has anyone ever seen basement ceiling radiators with one-pipe steam? I have done lots of research on the Wall and Internet but have so far only seen basement ceiling radiators with two-pipe steam. How would you vent a ceiling radiator with one-pipe steam? Really not a problem -- provided you have a little headroom. The thing to remember with a one pipe radiator is that both it and all the pipes leading to it have to be pitched to drain -- but that doesn't mean the radiator can't be installed on its side, so long as it isn't dead level. Or you can pipe it as a two pipe, with the return dropping below the water line. It would still need a vent. I have them in a now finished space in the basement. Even before the ceiling was finished and they were exposed they did very little to heat the space. Heat rises so it is more like adding heated floors to the rooms above. They will take the chill and dampness out but that's about it. You would be better off running a hot water baseboard loop off the boiler with a circulator pump and putting the space on it's own tstat. My building has 2 basement units that are heated with ceiling mounted one pipe radiators. 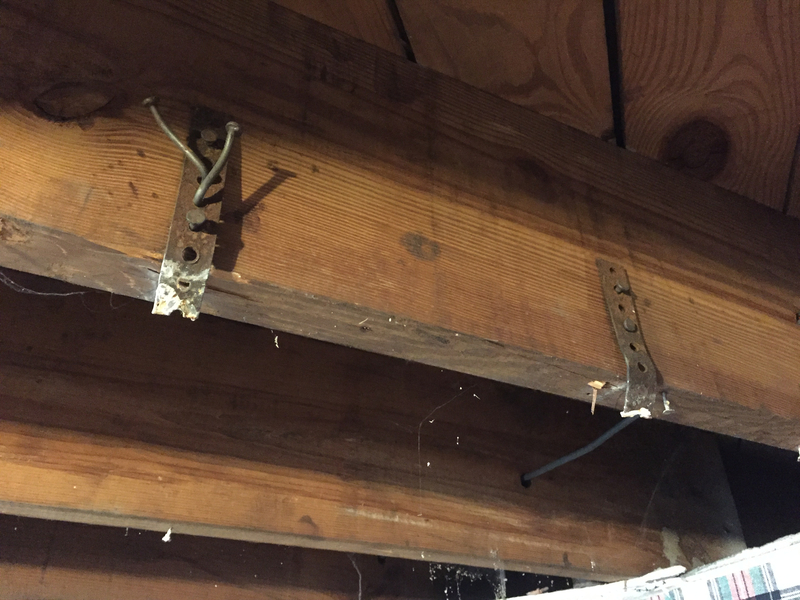 They are hung from the joists at an angle with the vent up. One unit has them enclosed in a chase with a thermostat controlled fan blowing air through the chase when the heat is running, it has made the unit very warm. Thanks for the help, I appreciate it. I think we will go with an OSC wall-type radiator. 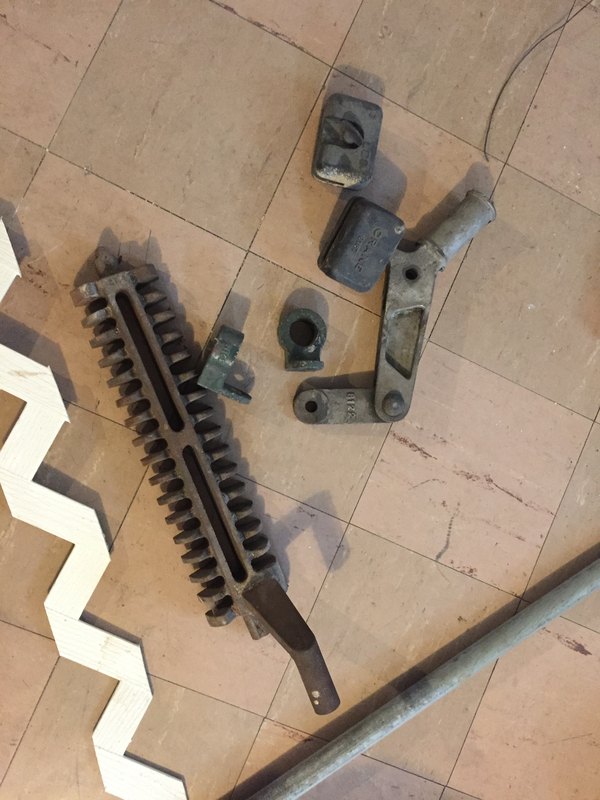 Another question: looking around the basement, I have found these cast iron pieces but don’t know what they are. They have the name “Crane” casted into them. Since we have Crane radiators, thinking this has something to do with the heating system - any ideas? For scale, the floor tiles are 8 inch squares. Apologies, here is the photo. Those look to me like they are part of an old coal fired boiler. Never seen those exact parts before, but that would be my guess. Others may know more. Neat find! The shaker grate with the crank handle when rocked back and forth would get ashes and clinkers down into the ash pan that set under it. Could have been two sets, perhaps one for wood and different for coal. Interesting ideas. There are about 6 of those shaker grates in total in the basement. They could all have been connected together in tandem. One top rail connecting the upper rod/shank of the grate. Maybe one crank would run all of them for easier shake down. I have two of them in Cedric's home -- Hoffmann vapour two pipe. They don't do much for heat in the basement -- but I've often wondered if by condensing like mad (which they do!) they might cause a generally faster steam flow and thus more even response times on the otherwise rather long steam mains... but never have done any work to verify that (if it ain't broke, don't fix it -- and there are always other things broke...). On the other hand, the third main doesn't have one, and seems to be just as fast. Sigh... someday when I have nothing else to do? On the shaker grates -- might have been either way. I've seen both setups (all together on one crank arm, or each one having a square drive which one rattled independently). Any recommendations for ways to hang the radiator? Brackets? 3/8" threaded rod with lag ends (Sammy's) up into floor joists. On the bottom end of the threaded rod you could use angle iron or big washers...something that wont fit through the slots in the radiator. "Sidewinder" type Sammies go into the side of the joist and have more pull out resistance than the straight in design. Also you have easier adjustment as both ends of the rods are able to spin up and down. That is old school (literally) hard ware shown in my picture. You could use 3/4" pipe for the trapeze and 3/4" pipe hanging clevis or "Auto Grips" to support the pipe. They come in all sizes of pipe and 3/8" threaded rod will support a lot of weight. Two pipe steam rad is shown, for your single pipe rad all 4 corners must drain towards your inlet valve. It would hang as a twisted sister draining to your valve. Air vent on the highest end opposite of valve. Just like laying a CI rad on it's side. BTW, that street 90 ell would not be part of your bsmt rad piping. It must have been an easy fitting to plug that opening. Thanks for the ideas everyone. And @JUGHNE , yes, I figured that elbow was just what the guy had at the time when he removed the radiator. I do plan to put new drywall up, so I will use 4 or 6 threaded rods with big washers. Just remember radiators work on the principle of convection, hot air goes up, not down. You will get minimal heat from a radiator in the ceiling, if you cover it with dry wall you won't even know its there, except for a warm floor above. You would be much better off adding a hot water baseboard loop to heat the basement room.